I love summer, but it sure can be hard on skin. There’s summer dryness, summer sun burn, summer bug bites and chlorine from the pool – all of which can make skin unhappy. With this Sweet Summer Scrub, we can (hopefully!) keep most of those potential problems in check. This recipe is rich in Sweet Almond Oil, which is known for being a lightweight oil chock full of oleic and linoleic essential fatty acids. That’s basically a fancy way of saying it’s incredibly moisturizing and absorbs into skin with ease. Our decadent Foaming Bath Whip acts as the gentle cleansing base to help give your skin a fresh start (all the better to take in that rich Sweet Almond Oil). With a little help from the some regular granulated sugar you can find at the grocery store, you’ve got yourself a gentle exfoliating scrub that is must-have summer skin care item. PREP: Before measuring out the oils, unwrap both packages of Foaming Bath Whip and combine in a large bowl (at least 64 oz.). 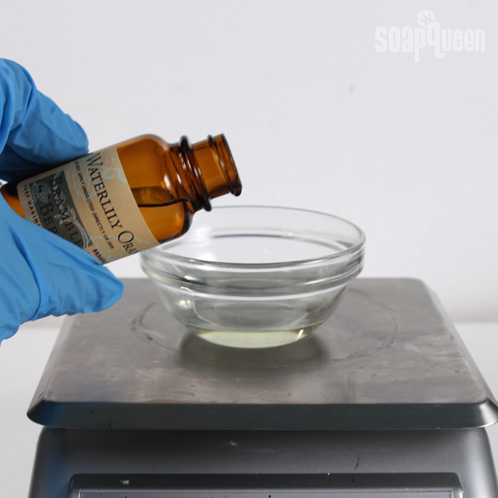 ONE: Combine the Foaming Bath Whip and Neroli and Shea Blossom Fragrance Oil in a large bowl. 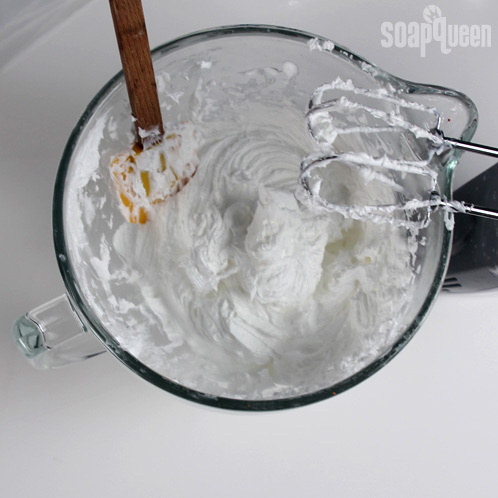 Whip using a handheld or stand mixer until the fragrance oil has been fully incorporated into the Foaming Bath Whip. 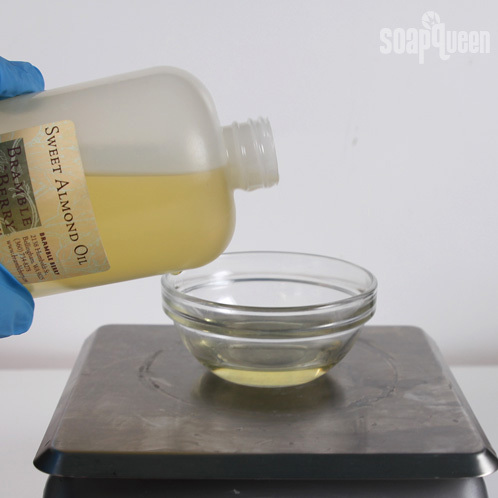 TWO: Portion out the Sweet Almond Oil and add it to the bath whip and fragrance oil mixture. 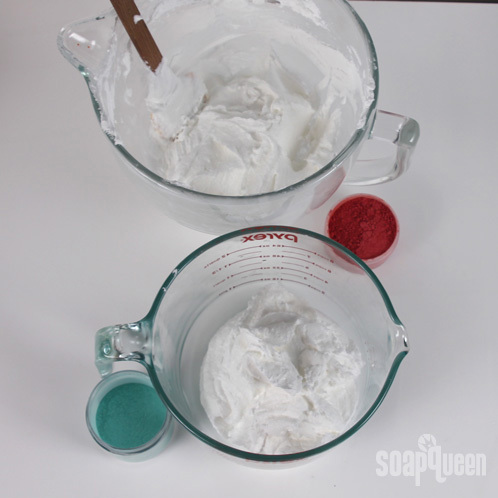 THREE: Using a hand mixer, combine the bath whip and oils. Whip until the mixture has approximately doubled in size (this is a good 5 – 10 minutes of mixing which is why a stand mixer is preferred). FOUR: Once the bath whip mixture has fluffed up, add in the sugar a little bit at a time, using a spatula to gently fold it into the mixture. Be careful to fully incorporate the sugar while not deflating the bath whip too much. FIVE: After fully incorporating the sugar, split the mixture into two equal parts. 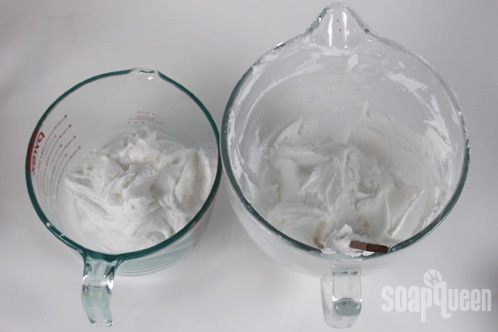 SIX: Add approximately 4 mini scoops of Coral Mica to one bowl of bath whip. Add the same amount of Aqua Pearl Mica to the other. The mica colorant is WYSIWYG, so it’s up to you how much to add. Add an extra scoop or two for a more intense color, but keep in mind that the base is white and your color will not evolve past a pastel. SEVEN: Cut the tips of the plastic frosting bags. 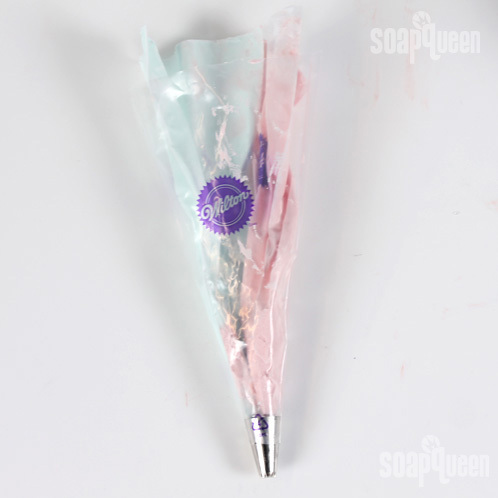 Using a spatula fill one frosting bag with the Coral colored mixture, and the other bag with the Aqua colored mixture. Then, put a frosting tip and the two filled bags inside a third bag. Squeeze until both colors come out in one stream through the third bag. Twist all three of the bags together at their openings to create a seal. EIGHT: With a steady hand, swirl the whip into a container. 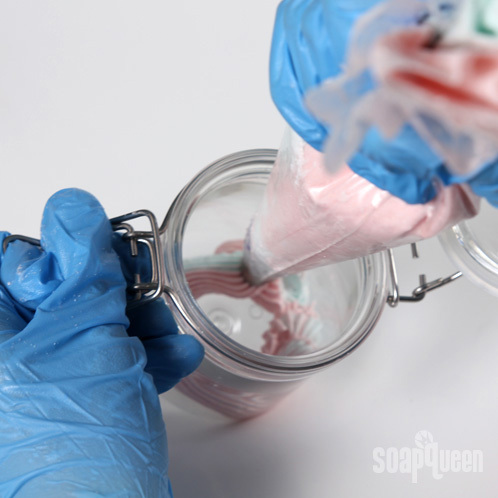 Move around the outside of the jar and work your way in as you squeeze. 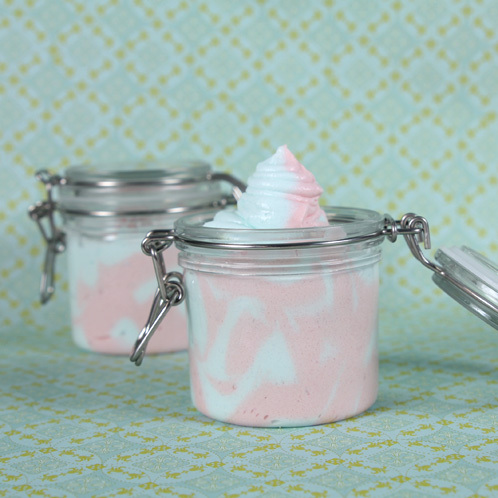 When you reach the middle, start swirling your way back to the outside of the jar. Repeat the swirl until you fill the jar to the top. There you go! 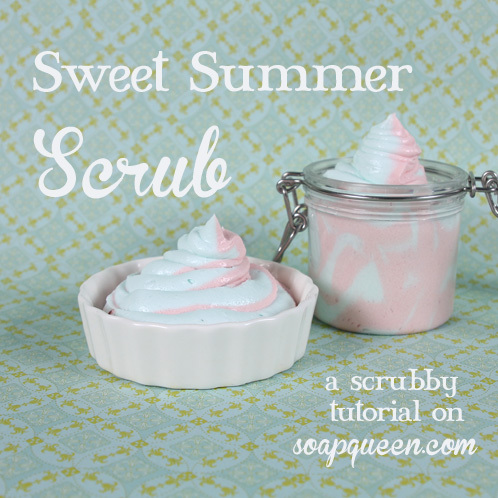 Enjoy your sweet summer scrub for those sweet summer days. Previous Post: Spring 2013 S.O.A.P. Fragrances Announced! I just made this amazing whip!!! I love it..so light and airy and can not wait to use it…my question is does it have to be stored in a cool place or just on a shelf as is? Thank You! And I don’t have micro scoops–could anyone tell me how much .60 cc’s of mica would be in either teaspoons or oz pretty please? Also, adding jojoba beads will add some extra scrubbiness to this recipe. It may help to make a small test batch with the jojoba beads and try it out. If you want it a little more or less scrubby, you can adjust the recipe from there. ~Thank you very much! I can’t wait to get my supplies in to make this scrub with spring finally here! I’m using your passionfruit papaya FO with and a sweet orange and chili pepper FO to make it extra sweet and ‘citrusy’ [with the red beads and merlot mica on one side and sanora beads and peach mica on the other], and my testers can’t wait to try it ^_^ They all loved the Rose Clay Sugar Scrub today! ~Someone asked already if you could sub the extra small sea salt for the sugar and the answer was a yes but at a lower usage rate-would I need to use even less of the salt if I’m adding jojoba beads? Also, you may want to use less salt if you’re adding jojoba beads. The small test batch would be helpful. That way you can see how scrubby it is and adjust from there! I’m not getting any extra volume, even using a stand mixer. I use 2 lbs of sugar instead of 1 and I get 8 8oz jars totaling about 64oz. My customers still love it, but I’m wondering if anyone else has had this issue? 5-10, but I stop every couple minutes to scrape the sides. I only add the sugar at the end and fold it in. 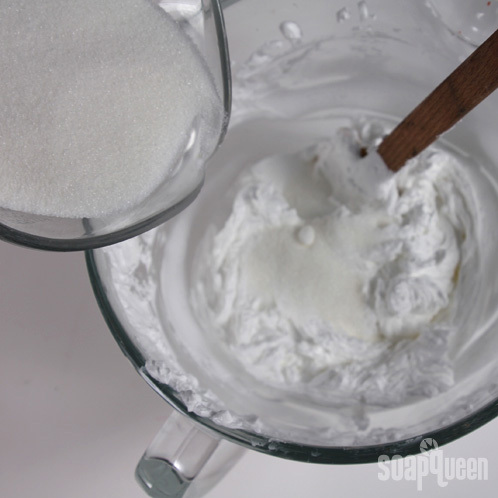 Also, if you’re adding more sugar, you may want to add more Foaming Bath Whip as well. More sugar can weigh it down a little. do you have to use micas? can you use liquid non-bleed colours? I’d really like to try this, but I’m so “Green” I’ve never even tried commercial products. Which means I have no clue how to use or store it. When you use it do you need to add a little water to moisten first? Looking forward to trying this! Are there general guidelines on the shelf life of this mixture once it is in the jar, or exposed to a water? Thanks! The shelf life on this sweet summer scrub is going to be as long as the ingredient with the shortest shelf life. In this case, it would be the Sweet Almond Oil which actually has a 1 year shelf life. Just got my foaming bath whip in the post, can’t wait to try this, thanks for the recipe! I love the way you were able to “two-tone” the colors! I will be using cucumber melon from BB as the scent! Um…Are we missing anything–is there supposed to be a Step 7? Whoops! Nothing’s missing =) I’ve updated the step numbers. Great catch! P.S. If you want a good scale, I’d suggest this one from Bramble Berry’s website. I use it at home and just love how it works. Oooh this looks fun. Thanks for sharing. I will have to bear too much skin though to use it so I will wait until we are not in the middle of Winter. ha ha.